Visit with family and friends one hour prior to the service.  A luncheon will follow in the Life Story Center. Burial will be at Hope Cemetery. Make checks payable to American Cancer Society. 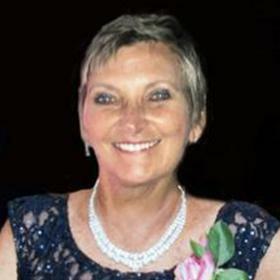 Cathryn (Ann) DeVisser, 63 years old, lost her valiant battle against breast cancer at Mount Sinai Hospital in Miami, Florida on April 8th, 2019. 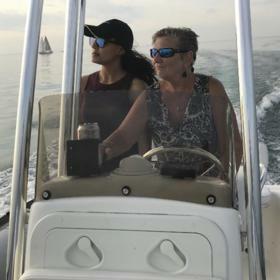 She was known for a lifetime of putting others before herself and so, despite immense fatigue, Ann arranged a vacation to the Florida Keys as a tribute to her loving husband Ken and their 42 years of marriage. Although unexpected, Ann's passing was peaceful with family and friends by her side. Ann was born to Wanda J. and Lewis Canney on May 11, 1955. In 1969, Wanda and Lewis purchased the Kalamazoo Culligan Water Treatment Plant and formed Canney's Water Conditioning, Inc. This business venture and their devout Catholic faith provided the stability for Wanda and Lewis to have seven children. It was here that their daughter Ann, named after her father's mother Cathryn Ann Canney, developed and honed her remarkable care-taking abilities, organizational skills and zest for life. Amid the sibling relationships and rivalries, her philosophical cry could be heard above the crowd, "Cut it out, Life is too short!" Ann graduated from Portage Northern High School and in 1974 met the love of her life, Ken DeVisser. 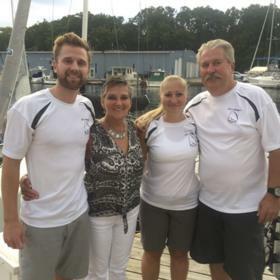 A marriage followed in 1977 and the two newlyweds took advantage of those child-free years to indulge their passions; snowmobiling, drag racing, dune buggies and water skiing behind the hi-powered jet boat. A daughter Lisa (Thompson) was born in 1985 and son Michael followed in 1988. The mechanized toys were replaced for a time in favor of a J-35 named "Jammin" while Ann introduced the children (including baby Lisa at six months of age) to a lifetime passion of sailing impervious to the judgmental stares of passerbys. Always a career woman, first working at Bronson Hospital and later at Canney's Water Conditioning, Ann balanced work, fun and friends but the priority was always her family. She was a busy soccer and softball mom but still managed to pack-up the car heading off to winter weekends for snow-skiing and racing then, switching gears, haul kids and sails in the summer to follow her husband's Regatta Circuit (even expanding her role to include trimming sails as a crew member if needed). In 1987, while expecting son Michael, Ann and Ken purchased property on the Black River in South Haven, Michigan. Thus began what their kids referred to as the "property;" packing up the car after school on Friday and heading to Lake Michigan until late Sunday evening. For many years, a fast 31-foot Stinger Chris-Craft sat eagerly awaiting their arrival. It was here that Michael discovered it was amusing to hold his breath and swim under the length of the boat causing his mother to run back and forth in a panic looking for him. It was a trick that never grew tired -- for him. 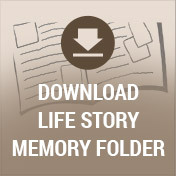 With all the organization required from their active, sports-centered family life, Ann was famous for being expertly prepared. Packing snacks, tissues and chapstick; she seemed ready for any potential catastrophe whether it occurred or not. Perpetually stashing the extra lifejacket, mittens or mad money in a pocket, it was only after everyone else was taken care of did she ever consider herself. Ann was naturally courageous and a determined fighter. Asking Ken to let her try out his Harley with more horsepower, he admonished, "It can get away from you" but she seemed always up for a challenge. Whether it was diving off a sailboat in the Grenadines, trimming a sail during a squall or downhill skiing the black diamonds at Crystal Mountain with Ken, Lisa and Michael, Ann appeared to be fearless. 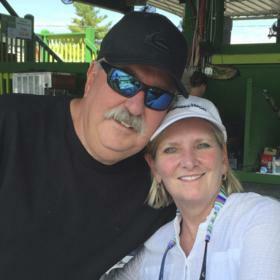 Ann and Ken rekindled their love of motorsports and purchased Harleys together. Hers was a Screaming Eagle Fat Boy in silver-and-orange which she loved because, "it's really loud and I love the bright colors!" Michael found it amusing to watch her as she first learned to ride but she was a fast study. On a trip to Sturgis, in pelting rain and little visibility, she rode the route to the end where Ken gave her the ultimate compliment, "I can't believe you kept up. I could have quit anytime!" More trips followed including Sturgis Bike Week and the Shootout at Lake of the Ozarks; she and Ken made great memories and new friends on every adventure. With her infectious laugh and sparkling blue eyes, Ann always turned strangers into friends. Her inclusive nature was welcoming to all; she freely shared her hospitality with others to make sure each felt included. She was also a hugger. 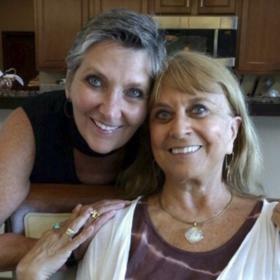 Sharing emotions came easily for Ann and made her an incredible friend as well as an empathetic listener. She and Lisa shared a love for shopping and coupons; it always impressed everyone that the saleswomen at Macy's knew her by name and brightened when she came in the door. No doubt, Ann made each and every one feel like family. As many observed throughout her lifetime, Ann was a goal setter. Obstacles in her path were to be tread upon. Reviewing the statistical odds concerning her disease, she observed, "those are just numbers...I can beat that." And she did. She vowed to see her daughter married and hold her first born grandson, “Parker" in her arms (both of which she achieved despite the professional naysayers). She was a steadfast sibling through the years. Loving to her brothers and sister, rejoicing in happiness and sharing sorrows, Ann was a special aunt to her nieces and nephews and always a most devoted daughter. Anyone who knew Ann also knew that her husband Ken was the Captain of her Heart and very best friend. Pushing her wheelchair through the Chicago airport just last week Ken remarked, "This is no big deal, I can do this for years." They were a dedicated team. Every Sunday Ann gladly trekked to LaRue's Restaurant in Oshtemo for Ken's required breakfast because she knew it was her husband's favorite meal of the day. One of the last sentences she spoke in the hospital was typical Ann, "get me out of here!". Yes, with Joe Louis determination she fought to the end ever hopeful for another adventure and more time with loved ones. Sandy beaches, Pina Colada's, wind in her face, the purr of her Harley-Davidson engine; Ann loved them all. But family was her greatest love. In this life she was the best First Mate for Ken but yet the Captain of her own ship. Those who loved her feel gratitude for fresh wind in her sails. One more Harley ride, this time heaven bound. We can take comfort that she crossed the bar with a heading on God's majestic light. May the legacy of her love be a compass that always points us in the right direction. Ann is survived by husband Ken DeVisser of Mattawan, son Dr. Michael DeVisser of Chicago, daughter Lisa (Travis) Thompson of Kalamazoo, and grandson Parker Thompson. Also surviving are her brothers Brian (Patrice) Canney of Portage, Scott Canney of Belleair Beach, FL, Sean Canney of Portage, MI, Kevin (Vicky) Canney of Edwardsburg, sister Mary Jane (Jim) Midgett of Mattawan her brother and sister-in-law Sue (Rich) Harrison of Kalamazoo and numerous nieces and nephews. Preceded in death by her mother Wanda J. Canney (2017), father Lewis Charles Canney (1984), and brother Terry Jay Canney (1982). Visit with Ann’s family and friends on Monday (Apr. 15) from 4-7 pm at the Betzler Life Story Funeral Home, 6080 Stadium Drive; Kalamazoo (269) 375-2900 where services will be held Tuesday at 11am with visitation one hour prior. Burial will follow at Hope Cemetery. Please visit Ann’s personal web page at www.BetzlerFuneralHome.com, where you can archive a favorite memory or photo and sign her online guestbook before coming to the funeral home. Memorial donations may be made to Making Strides Against Breast Cancer.